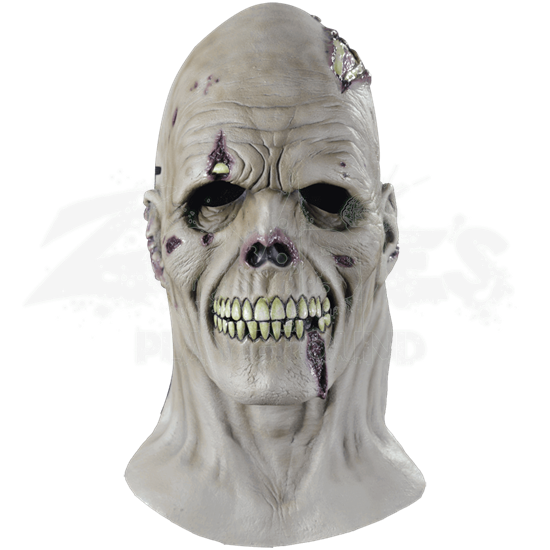 Sculpted by Jeff Death from Death Studios, the Cadaver Face Mask is part of the Death Studios Collection in collaboration with Trick or Treat Studios. This licensed corpse skull mask will creep you out with its incredible realism. The mask provides 3/4 cover with a strap that secures it comfortably while wearing. Featuring a skull face and neck with open wounds and exposed bone, this undead corpse is ready to roam the streets of the living. The blood trails from the missing tooth and open wounds provide a unique look to the mask. This mask is sure to frighten those who dare cross its path!